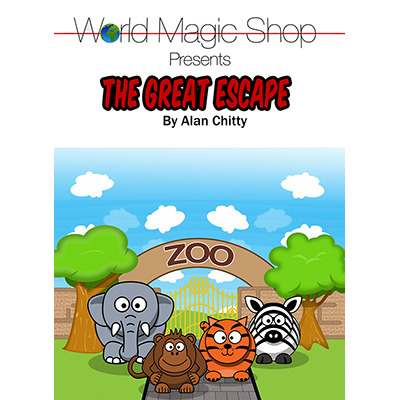 You and the audience create a story The Great Escape" featuring 4 animals in a Zoo. The audience make all the decisions about everything that happens in the story including the ending. An envelope containing the "official" version of the story, which has been on display throughout, is now opened and it exactly coincides with the story that the children produced. Four children are invited onto the stage to create and act out a story - The Great Escape. As each child comes out, they are asked to choose one of the four animals, which are printed on large cards and the rest of the audience impersonates the animal's noises and actions. This creates fun and interaction with the children before the effect even begins. The story takes place over three days and the children choose which animals escape and which are recaptured on each of the three days. They have total control and, depending on their choices the story line can develop in many different ways. Only one thing is certain - the children's outcome will ALWAYS exactly coincide with the prediction! 5-7 Minutes of kids entertainment with a story the audience make up. Involves 4 or 5 children during the routine.